Victoria Concordia Crescit – When and Why? I recently stumbled across the answer whilst looking for something else. 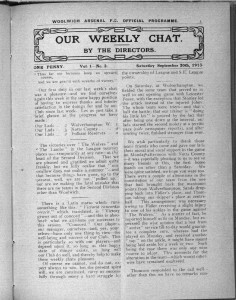 A clear case of serendipity which frequently happens as the members of the AHS read through old newspapers, programmes, books and other documents. As you are no doubt aware, Woolwich Arsenal moved from Plumstead to Highbury 100 years ago this summer. The last season in Plumstead had been dire as the club recorded its worst ever performance on the pitch. It would be another 70 years before another team had such a disastrous season in the top flight. Attendances hit rock bottom as well and the directors had no option but to move the club to a more accessible area. In the current climate maybe it is worth giving this a second thought – Victory Grows Through Harmony. 16 comments to Victoria Concordia Crescit – When and Why? that has never been in a lower division then? No, Arsenal started off in the Second Division in 1893 and were promoted in 1904. They were then relegated and played in the Second Division for the 1913-14 and 1914-15 seasons. I think maybe we just hold the record for the team playing for the longest in the top flight, is that correct? In which case I wonder if the never been relegated theory actually applied to Coventry before they finally took their nose dive a few years back. Everton have been in the top flight for most number of years overall. Arsenal have the longest consecutive number of years in the top flight. Mark Andrews is right, Arsenal continuously in top flight since 1919, Everton since 1954, Arsenal bought their way back into the top flight after the suspension of the league for WW1. Everton and Villa both have over 100 years in the top flight. Liverpool as a city, 2 clubs Everton and Liverpool, has more championships then any other city in England. Bill Thomas, it looks like you could be in the money. 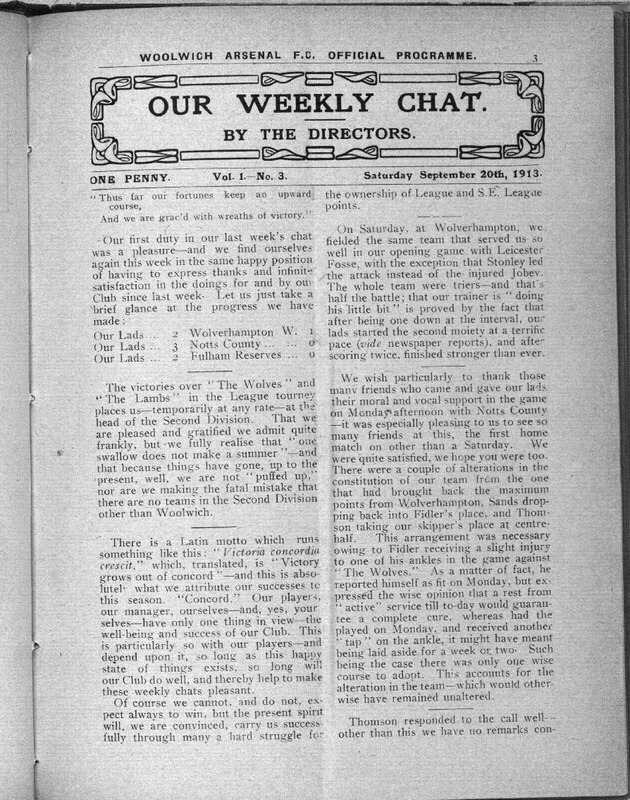 As you’ll know we have offered £100 to anyone who can supply evidence of corruption concerning Arsenal’s entry to the first division in 1919. So if you would like to supply that evidence you should be a winner since no one has claimed it yet. You might find http://www.blog.woolwicharsenal.co.uk/archives/5592 helpful too. Tony, I remember being told about this around 1992/3 by a lifelong Arsenal supporter at work, he backed it up with info from the old News of The World football annual. Arsenal finished 6th in division 2 and “somehow were promoted” to an expanded division 1 afer WW1, replacing Spurs who had finished 20th in division 1 and leapfrogging Wolves and Burnley who finished above Arsenal in division 2. I am a lifelong Everton fan and we used to have some very interesting discussions. Only came across this page because the Arsenal motto was referenced in a story about Evertons new crest design, I had forgotten what it meant. Unfortunately I can offer no proof other than what I have been told. Bill Thomas, that’s a clever one: treating the 18 championships of Liverpool FC as your own. I see that of Everton’s 9 wins, 5 were pre-WWII (2 of them prehistoric). Compared with Arsenal’s 13 wins, 5 of them pre-WWII (all Thirties). Mike,numbers are amazing,if you add on the the years that Everton have actually held the league title you get another 10, they were holders prior to each war and the competition was suspended. As Evertons song goes “And if you know your history”. Without history in any game, football cricket, union, league it would be pretty dull, got to have something to throw up when you are going through a lean streak. Andy, I would love to lighten your pocket but only know of the story. Good luck this season to your team. Arsenal officially have never been relegated due to, the requirements for relegation would require finished in the specified zone, arsenal dropped a league due to the division 1 and 2 splitting to make 3 leagues. In the season 1912-13 Arsenal came bottom of the first division and so were relegated to division 2. The won 3 games that season and gained 18 points, going down with Notts County. Preston NE and Burnley were promoted from division 2. Arsenal returned to the first division in 1919 and played there in 1919/20. The Third division was created for the 1920/21 season with a lot of the Southern League clubs joining the football league. Perhaps you could give us dates of the season you are thinking about and we’ll look at it in detail. i dont think The Arsenal have ever been relegated under the name Arsenal ,i think it was Woolwich Arsenal …. That is of course true, but because Arsenal have had a variety of names (Dial Square, Royal Arsenal, Woolwich Arsenal, The Arsenal and Arsenal) and because there is much dispute as to when the name changed on at least one occasion, we often use the name “Arsenal” to encompass the entire history of the club. It was after all the same club throughout.